(February 18, Colombo, Sri Lanka Guardian) Mr. D G Suthisa Kumara Jayalath (25) and Mr. W V Mahendra Uppalawanna (18) of Pahalawela, Pareigama, Via Matugama were illegally arrested and severely tortured in public by three drunken police officers attached to the Welipanna Police Station. Later they were brought to the station where they were hung from a beam. The police were reluctant to release them due to the marks of torture the two men bore. They were arrested on the morning of 20 May, 2010 and released on the evening of the 21st. After their release the two victims were treated first in the Iththapana Government Hospital and as their condition was serious they were transferred to the Nagoda General Hospital for further treatment. The victims were threatened by police officers not to take action against the police. The local government representative also tried to suppress the victims attempt to seek justice. The two men are now in fear of their lives as all the statutory bodies (the Human Rights Commission and the National Police Commission) and senior police officers are silent on the complaint. This case is yet another illustration of the exceptional collapse of the rule of law in the country. According to the information, Mr. D G Suthisa Kumara Jayalath (25) of Pahalawela, Pareigama, Via Matugama and Mr. W V Mahendra Uppalawanna (18) who resides in the same village were tortured by police officers attached to the Welipanna Police Station. On 20 May 2010 around 11.45 am Mahendra was at the home of Suthisa. Suddenly three police officers in civilian clothes came into the house and arrested Mahendra. At that time he realised that they were inebriated. They then arrested Suthisa also. Prior to the two arrests the officers, contrary to the law, did not reveal any reason for their action. Mahendra indentified them as police officers as he had seen one of them previously in the village. Then one officer seized Mahendra by the clothes around his waist and took him out of the house. While Mahendra was being forcefully handled his gold chain was broken. As Mahedra wanted to leave it at home the officers brought him to his house. There the police officer started to beat Mahendra by kicking and punching him. While he was being beaten Mahendra fell to the ground and the beating continued as he was trying to getting up. Though Mahendra was able to stand up he was not able to keep his sarong properly fastened. Finally he was brought before his home where he was able to hand over his belongings to his mother. The beating was witnessed by the small children of the house which was located in close proximity to the place where he was tortured. They witnessed the cruelty and arrogance of the police officers as they deliberately tortured Mahendra in public. When Mahendra asked the officers for the reason they were beating him one officer told that him that this was not torture. "We will torture you to remember the mother who fed you milk when we take to the police station." (This is a common euphemism used by the Sri Lankan police to describe serious torture). Finally Mahendra was brought to a location on the way where he discovered that Suthisa also has brought by the police officers as he was bleeding from the mouth. Then he understood that Suthisa had also have been tortured by the police officers. Again Mahendra asked the officers why they were being beaten. 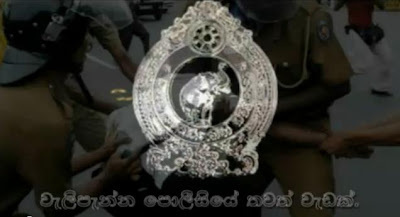 It was only then that the officers asked them to hand over the goods they had stolen from the boutique of Mr. Wasantha. Mahendra totally denied the accusation and told the officers they had never done such a thing. The officers continued to beat Mahendra and then they were both ordered to kneel down so that the officers could kick them. Later they were brought to the Welipanna Police Station by a motor bicycle belong to the officers and locked up in a police cell. After five minutes Mahendra was brought out from the cell and taken to another location in the building. There he was asked to sit on the ground and threatened that if he not reveal the truth he would have to faced severe consequences. An officer tied his wrists with a sock and suspended him from s roof beam. Mahendra observed that a police officer was sleeping in that room and understood that the room might be the officers' rest room. Mahendra was suspended for ten minutes and then taken down. This treatment went on for the period of 45 minutes and Mahendra realised that the officers were inebriated. Mahendra was brought back to the cell and Suthisa noticed that his thumbs were swollen and blue. Further he noticed that Mahendra could not walk properly. When Suthisa asked what happened, Mahendra tried to demonstrate but failed. Then Mahendra told Suthisa that he was hung by the wrists. The officers who brought Mahendra back to the cell informed the Suthisa to be prepared for his turn. Suthisa was also severely beaten just after he was arrested and while he was brought to the location where he met Mahendra and the other officer. Due to the beating he started to bleed from the mouth. Suthisa's torture was witnessed by many villagers. In the evening one officer handed over a document to Suthisa which contained his name, address and the time of arrest as 1500 hours. Further in that document it was noted PS 28019 as the arresting officer. On thenext day all the detainees at the cell were brought out and released on bail. Though Mahendra and Suthisa was brought out later by the officers as they were reluctant to release saying that they (the officers) would be in big trouble with the Officer-in-Charge (OIC) if he found out what had happened. Both of them were locked up again. Several times on 20 and 21 the relatives of the victims came to visit them at the station. Finally in the evening the two detainees were released. On 22 Mahendra and Suthisa were admitted to the Iththepana Government Hospital. But as their condition was serious both of them were transferred to the Nagoda General Hospital. Mahendra was admitted to ward No: 11 while Suthisa was admitted to ward 8. Suthisa went through an X-ray examination and the Judicial Medical Officer (JMO) examined him and officers at the police post also recorded a statement. He was directed to the clinic and discharged on 24 May. While they were treated in the hospital on 23 May, Suthisa got a telephone called from the mobile number 072-4365298 from a person who identified himself as an officer attached to the Criminal Investigation Unit and questioned whether they are proceeding with their complaint to the Human Rights Commission to which he replied in the positive. Then Suthisa was threatened. Later on 17 July Suthisa complained to the Assistant Superintendent of Police (ASP) of the area regarding the incident. But no investigation has been held on that yet. Then on 13 September a Member of Local Government Body (Pradesheeya Saba), Mr. Janaka Kumara Gunasekara came to Suthisa and asked him to come to the police station on 15 September with him to talk about the matter with police officers. Suthisa refused. Then Suthisa and Mahendra complained to the National Police Commission (NPC) and to the Human Rights Commission and to the ASP. Mahendra and Suthisa state that they were illegally and arbitrary arrested by the police officers and detained. Further they state that they were physically and mentally tortured severely in public. Further they state that they are continuously receiving threats from police officers. The Local Government Councilors even as the people's representatives are trying to suppress justice and helping to provide impunity while representing the police officers. Further Mahendra and Suthisa desperately state that the senior officers in the police department, the NPC and HRC have not carried out their statutory duties to investigate their complaints or provide protection or justice to them. Suthisa and Mahendra are presently in fear of their lives and are still seeking justice and protection. The experiences of the two men can be viewed from the video here.